Who here has been playing the the Telltale Batman series? What did you think the of the conclusion of Season 2? This is probably become one of my favourite non-Canon Batman incarnations... It gets very dark, but the characters are so very compelling. Just wow the fun house confrontation with Joker is amazing. Especially the Never Have I Ever game. I can't wait to do another play through of both seasons. I absolutely loved what they did with the Joker in this season. For me, it isn't exactly correct to state that Batman created the Joker, but rather that the Joker is a reaction to Batman if that makes sense. 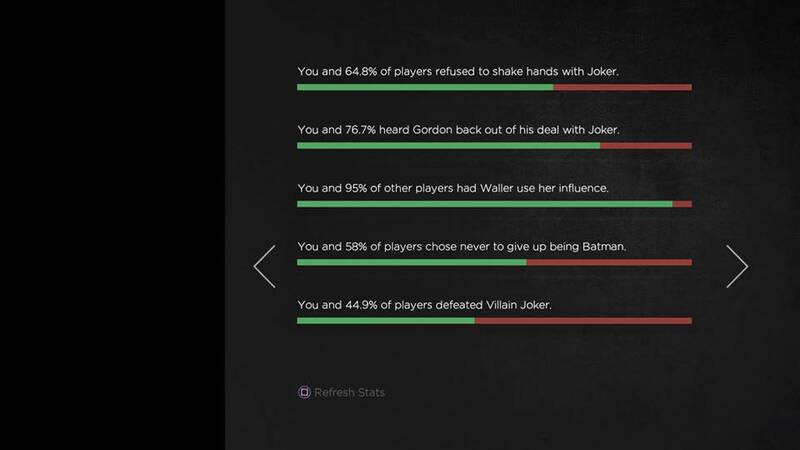 Yet the way this game approached that and how we saw proto-Joker struggle with who he was with those interactions with Bruce ultimately resulting in the birth of the greatest monster Gotham would ever know. And with the Villain Joker path, his introduction was just chilling in its brutality and creativity. My only confusion with the final choices and the ending, which were brilliant and gut-wrenching, is that this game ends in such a dark place that it feels like there should be a third game, but at the same time there are so many ending states that I don't know how they could do a third game. As for my final choices, I went with Villain Joker, had the regretful Gordon reinstated as the commissioner, wiped out Catwoman's record, recruited Avesta to Wayne Corp, felt that Tiffany should face justice and had Bruce remain Batman. Especially that final choice was so brutal as at the same time you could completely understand Alfred's demand, but it would have just felt wrong for Bruce to be able to turn his back on the Bat. I can't put into words how much I loved this game. I should have asked Avesta to join Wayne Corp, but I just warned Waller off hurting her. And yes that final choice was brutal, but if Bruce was able to just stop being Batman Alfred wouldn't need to walk away in the first place. Anyway I think at first I was thinking season three would be hard, but it isn't real. The first episode will just have to have two branches that come back to the same place. Either A) Bruce is retired, but something comes up that even Alfred agrees needs the Batman. or B) Alfred is in Gotham for reasons, and doesn't want to see Bruce but they are thrown together for reasons. and the choices funnel back to having all three need to work together. During which time they either come closer together, or don't. It'll e a challenge, but I don't think it's impossible. There is also Gordon variable, which is also really wide open. And that's not even touching on Avesta and Selina choices. It isn't impossible, but it would be a gargantuan task to pull off in a satisfying manner. I do hope, though, that they have a plan as I really think that this game needs a sequel for so many reasons. For example I feel there is so much story still to tell with Lady Arkham as that character can truly only exist in this canon. I thought Lady Arkham was a great character, but I also feel like her story was told, and there's not much more to be done with her... Of course if this was the comics she could keep coming back, but with five episodes to a season I'd like to see them keeping doing fresh takes on other characters rather than retread. As for Gordon, honestly I think it's best to retire him for the next season. Either his wounds caught up with him or he never took the job back. Avesta should probably only have a cameo if he works for Bruce... and Selina is just still Catwoman, and either loves Bruce or hates him. It's a huge task, I agree, but It can be done. 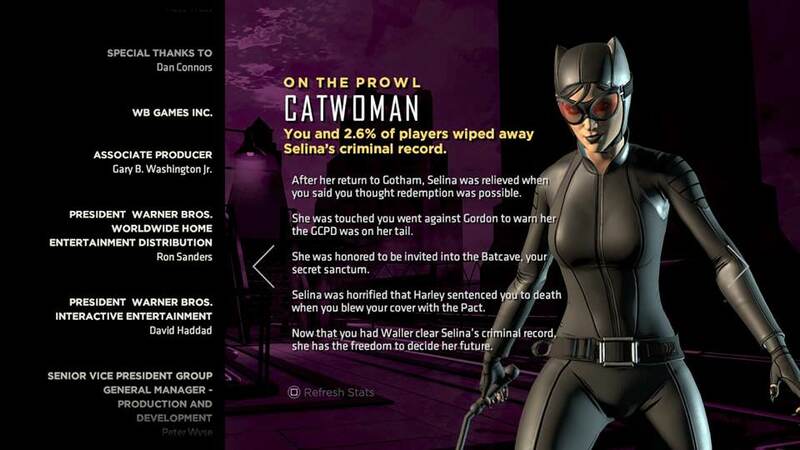 I can see that Lady Arkham argument, but to me it felt like we only had the half of the story with that. We got to the point where she realized that the force she almost seemed to admire in Batman was also the man whose legacy she despised. Since we can't get this character in the actual comics, it would be fascinating to see what she does next. It also helps that she is such a great twisted reflection of this version of Batman. However, if there is a sequel series, I think we are about to see R'as arriving to this mythos and the neat twists they can come up with him. He just feels like a natural choice to have the story affirm what makes Batman inspirational. As far as I'm concerned the Team Four Star playthrough is "canon" and just like them I fell in love with John Doe as a Batman fanboy. They ended up with John on the vigilante path (maybe as the Red Hood?). I liked it. Really felt bad for Joker at the end although in my playthrough Bruce visited him at the asylum. 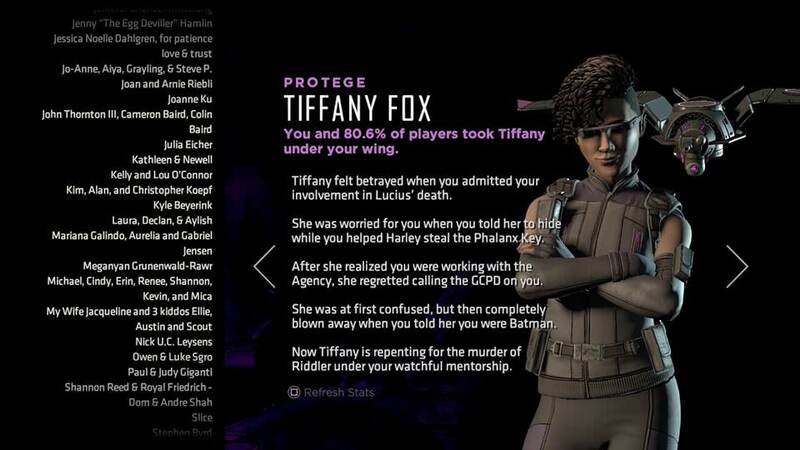 Kept Bruce as Batman, continued working with Gordon and offered Tiffany a chance to redeem herself. I, uh, feel very guilty and a bit emotionally traumatized! :D The vigilante!Joker path contributes to the former, the villain!Joker path - to the latter. I always play TG games at least twice in a row, so I can see all the variables, and I'd say that vigilante Joker is extremely funny, some moments are just hilarious, but the rooftop "break-up" and all the events afterwards seem to paint Batman as a real creator of the Joker, while the second route puts a_part_ of that guilt on him. Most TG games I play twice, with season one of Batman that didn't hold a lot of appeal cause I didn't feel like going nasty and there didn't seem to be a lot of divergence. With the second season, I do look forward to a replay, but haven't had a chance yet.